"RVO" redirects here. For other uses, see RVO (disambiguation). "LVO" redirects here. For the large countable ordinal, see Large Veblen ordinal. The Royal Victorian Order (French: Ordre royal de Victoria)[n 1] is a dynastic order of knighthood established in 1896 by Queen Victoria. It recognises distinguished personal service to the monarch of the Commonwealth realms, members of the monarch's family, or to any viceroy or senior representative of the monarch. The present monarch, Queen Elizabeth II, is the sovereign of the order, the order's motto is Victoria, and its official day is 20 June. [n 2] The order's chapel is the Savoy Chapel in London. There is no limit on the number of individuals honoured at any grade, and admission remains at the sole discretion of the monarch, with each of the order's five grades and one medal with three levels representing different levels of service. While all those honoured may use the prescribed styles of the order—the top two grades grant titles of knighthood, and all grades accord distinct post-nominal letters—the Royal Victorian Order's precedence amongst other honours differs from realm to realm and admission to some grades may be barred to citizens of those realms by government policy. 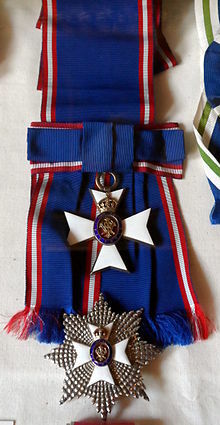 Prior to the close of the 19th century, most general honours within the British Empire were bestowed by the sovereign on the advice of her British ministers, who sometimes forwarded advice from ministers of the Crown in the Dominions and colonies (appointments to the then most senior orders of chivalry, the Most Noble Order of the Garter and the Most Ancient and Most Noble Order of the Thistle, had been made on ministerial advice since the 18th century and were not restored to the personal gift of the sovereign until 1946 and 1947, respectively). 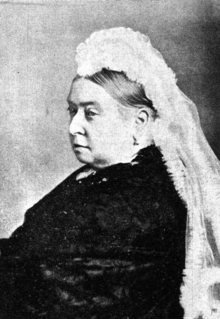 Queen Victoria thus established on 21 April 1896 the Royal Victorian Order as a junior and personal order of knighthood that allowed her to bestow directly to an empire-wide community honours for personal services. The organisation was founded a year preceding Victoria's Diamond Jubilee, so as to give the Queen time to complete a list of first inductees. The order's official day was made 20 June of each year, marking the anniversary of Queen Victoria's accession to the throne. In 1902, King Edward VII created the Royal Victorian Chain "as a personal decoration for royal personages and a few eminent British subjects" and it was the highest class of the Royal Victorian Order. It is today distinct from the order, though it is officially issued by the chancery of the Royal Victorian Order. After 1931, when the Statute of Westminster came into being and the Dominions of the British Empire became independent states, equal in status to Britain, the Royal Victorian Order remained an honour open to all the King's realms; thus, as with the monarch who conferred it, the order ceased to be purely British. The order was open to foreigners from its inception, the Prefect of Alpes-Maritimes and the Mayor of Nice being the first to receive the honour in 1896. The reigning monarch is at the apex of the Royal Victorian Order as its Sovereign, followed by the Grand Master; the latter position was created in 1937 and was occupied by Queen Elizabeth (later the Queen Mother) from that date until her death in 2002. Queen Elizabeth II then appointed her daughter, Anne, Princess Royal, to the position in 2007. Below the Grand Master are five officials of the organisation: the Chancellor, held by the Lord Chamberlain; the Secretary, held by the Keeper of the Privy Purse and Treasurer to the Queen; the Registrar, held by the Secretary to the Central Chancery of the Orders of Knighthood; the Chaplain, held by the Chaplain of the Queen's Chapel of the Savoy; and the Genealogist. Thereafter follow those honoured with different grades of the order, divided into five levels: the highest two conferring accolades of knighthood and all having post-nominal letters and, lastly, the holders of the Royal Victorian Medal in either gold, silver or bronze. Foreigners may be admitted as honorary members, there are no limits to the number of any grade, and promotion is possible. The styles of knighthood are not used by princes, princesses, or peers in the uppermost ranks of the society, save for when their names are written in their fullest forms for the most official occasions. Retiring Deans of the Royal Peculiars of St George's Chapel at Windsor Castle and Westminster Abbey are customarily inducted as Knights Commander; clergymen appointed to the higher levels of the Royal Victorian Order do not use the associated styles, however, and honorary members are not permitted to hold them at all. Prior to 1984, the grades of Lieutenant and Member were classified as Members (fourth class) and Members (fifth class), respectively, but both with the post-nominals MVO. On 31 December of that year, Queen Elizabeth II declared that those in the grade of Member (fourth class) would henceforth be Lieutenants with the post-nominals LVO. Upon admission into the Royal Victorian Order, members are given various insignia of the organisation, each grade being represented by different emblems and robes. 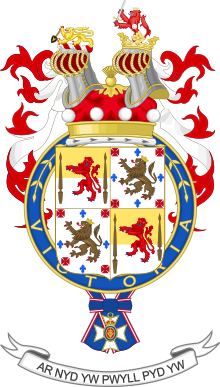 Common for all members is the badge, which is a Maltese cross with a central medallion depicting on a red background the Royal Cypher of Queen Victoria surrounded by a blue ring bearing the motto of the order—VICTORIA—and surmounted by a Tudor crown. However, there are variations on the badge for each grade of the order: Knights and Dames Grand Cross wear the badge on a sash passing from the right shoulder to the left hip; Knight Commanders wear the badge on a ribbon at the neck; male Commanders, Lieutenants, and Members wear the badge from a ribbon on the left chest; and women in all grades below Dame Grand Cross wear the badge on a bow pinned at the left shoulder. For Knights and Dames Grand Cross, Commanders, and Lieutenants, the Maltese cross is rendered in white enamel with gold edging, while that for Knights and Dames Commander and Members is in silver. Further, the size of the badge varies by rank, that for the higher classes being larger, and Knights and Dames Grand Cross and Knights and Dames Commander have their crosses surrounded by a star: for the former, an eight-pointed silver star, and for the latter, an eight-pointed silver Maltese cross with silver rays between each arm. The medal bears the effigy and name of the reigning sovereign at the time of its awarding, as well as the phrase DEI • GRATIA • REGINA (or REX) • F.D. (by the grace of God, Queen (or King), Defender of the Faith), and on the reverse is the Royal Cypher upon an ornamental shield within a laurel wreath. Bars may be awarded to each class of medal for further services, and should recipients be awarded a higher level of medal or be appointed to a grade of the order itself, they may continue to wear their original medal along with the new insignia. The order's ribbon is blue with red-white-red stripe edging, the only difference being that for foreigners appointed into the society, their ribbon bearing an additional central white stripe. For Knights Grand Cross, the ribbon is 82.5 millimetres (3.25 in) wide, for Dames Grand Cross 57.1 millimetres (2.25 in), for Knights and Dames Commander 44.4 millimetres (1.75 in), and for all other members 31.7 millimetres (1.25 in). At formal events, or collar days, of which there are 34 throughout the year, such as New Year's Day and royal anniversaries, Knights and Dames Grand Cross wear the Royal Victorian Order's livery collar, consisting of an alternating string of octagonal gold pieces depicting a gold rose on a blue field and gold oblong frames within which are one of four inscriptions: Victoria, Britt. Reg. (Queen of the Britons), Def. Fid. (fidei defensor, or Defender of the Faith), and Ind. Imp. (Empress of India). The chain supports a larger octagonal medallion with a blue enamel surface edged in red and charged with a saltire, over which is an effigy of Queen Victoria; members of the order suspend from this medallion their insignia as a badge apendant. Though after the death of a Knight or Dame Grand Cross their insignia may be retained by their family, the collar must be returned. 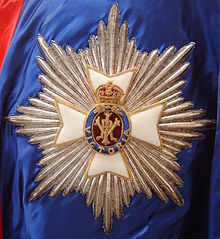 Knights and Dames Grand Cross also wear a mantle of dark blue satin edged with red satin and lined with white satin, bearing a representation of the order's star on the left side. Since 1938, the chapel of the Royal Victorian Order has been the Queen's Chapel of the Savoy, in central London, England. However, the population of the order has grown to the point that the Savoy chapel can no longer accommodate the gathering of members held every four years, and St. George's Chapel at Windsor Castle is now employed for the event. The Sovereign and Knights and Dames Grand Cross of the order are allotted stalls in the Savoy chapel's choir, and on the back of each stall is affixed a brass plate displaying the occupant's name, coat of arms, and date of admission into the organisation. Upon the occupant's death, the plate is retained, leaving the stalls festooned with a record of the order's Knights and Dames Grand Cross since 1938. There is insufficient space in the chapel for the display of knights' and dames' banners and other heraldic devices. The Royal Victorian Order Association of Canada exists for all Canadians appointed to the order or who have received the Royal Victorian Medal; it is the only such organisation in the Commonwealth realms. Founded by Michael Jackson, the group has, since 2008, gathered biennially. Membership in the Royal Victorian Order is conferred by the reigning monarch without ministerial advice on those who have performed personal service for the sovereign, any member of his or her family, or any of his or her Governors-General. All living citizens of any Commonwealth realm, including women since 1936, are eligible for any of the five levels of the order, save for Canadians: as admission to the top two levels of the organisation provides for an honorary prefix, Canadians are not normally appointed to these levels as long as the monarch's Canadian ministry adheres to the Nickle Resolution of 1919. As it was deemed by the Canadian Cabinet to be an honour within the gift of the monarch, the appointment of Canadians to the order resumed in 1972 and eligibility was extended to those who render services to the monarch's representatives in the country; officials within the provincial spheres being included after 1984. Originally, the Queen chose inductees herself, though the Governor General of Canada and the Canadian Secretary to the Queen could provide suggestions, some passed to them by the lieutenant governors. The practice of notifying the Prime Minister of Canada of nominees ended in 1982, to distance the order as far from politics as possible. It was reported in 2008 that some in the Chancellery of Honours at Rideau Hall wished to eliminate the Royal Victorian Order from the Canadian honours system and sometimes contested when a Canadian was appointed; however, no formal changes were ever planned. In Canada, the order has come to be colloquially dubbed as the "Royal Visit Order", as the majority of appointments are made by the sovereign during her tours of the country. Foreign members will generally be admitted as honorary members of the Royal Victorian Order when the Queen is making a state visit to the individual's country or a head of state is paying a state visit to the United Kingdom. Persons have been removed from the order at the monarch's command. Anthony Blunt, a former Surveyor of the Queen's Pictures, was in 1979 stripped of his knighthood after it was revealed that he had been a spy for the USSR. Also, William Pottinger, a senior civil servant, in 1975 lost his membership in both the Order of the Bath and the Royal Victorian Order when he was jailed for corruptly receiving gifts from the architect John Poulson. ^ The order is different for honours received prior to 6 October 1992. ^ The order is different for honours received prior to 1 June 1972. 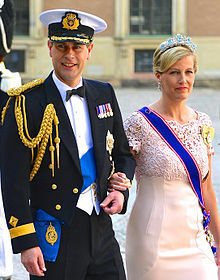 In the United Kingdom, the wives of male members of all classes also feature on the order of precedence, as do sons, daughters and daughters-in-law of Knights Grand Cross and Knights Commanders; relatives of Dames, however, are not assigned any special precedence. As a general rule, individuals can derive precedence from their fathers or husbands, but not from their mothers or wives. Grand Master: Anne, Princess Royal KG KT GCVO QSO GCL CD FRCVS FRS, appointed Dame Grand Cross in 1974; Grand Master since 2007. ^ For use in Canada, in accordance with the country's policy of official bilingualism. ^ 20 June 1837 was Victoria's Accession Day. ^ a b c d e f g h Royal Household. "The Queen and the UK > Queen and Honours > Royal Victorian Order". Queen's Printer. Archived from the original on 19 July 2009. Retrieved 6 August 2009. ^ a b c d e f Dundas, Charles (2008). "The Royal Victorian Order Conundrum" (PDF). Canadian Monarchist News. Vol. Spring 2008 no. 28. Toronto: Monarchist League of Canada. p. 6. Retrieved 6 August 2009. ^ "Irene White Appointed to Royal Victorian Order" (Press release). Queen's Printer for Saskatchewan. 27 June 1995. Archived from the original on 5 October 2017. Retrieved 6 August 2009. ^ "Select Committee on Public Administration Fifth Report". Queen's Printer. 13 July 2007. Retrieved 8 November 2006. ^ "No. 26733". The London Gazette. 24 April 1896. p. 2455. ^ a b c d Office of the Governor General of Canada. "Honours > National Orders > Royal Victorian Order". Queen's Printer for Canada. Archived from the original on 9 October 2006. Retrieved 6 August 2009. ^ "Birthday Honours - A Long List - Five New Peers - Many Baronets And Knights". The Times. 4 June 1917. p. 9. An interesting honour is that awarded to Lord Rosebery, upon whom the King has conferred the Royal Victorian Chain, the highest class of the Royal Victorian Order. ^ Arthur, Balfour (November 1926). Imperial Conference 1926: Inter-Imperial Relations Committee Report (PDF). London, UK: King's Printer. p. 1. E (I.R./26) Series. Retrieved 29 July 2009. ^ George V (11 December 1931). The Statute of Westminster, 1931. 2.2. Westminster: King's Printer. Retrieved 29 July 2009. ^ a b c d e f "People > Honours > Orders of Chivalry > Royal Victorian Order". Debrett's Limited. Archived from the original on 21 October 2010. Retrieved 9 August 2009. ^ a b c d e f "The Royal Victorian Order". Cambridge University Heraldic and Genealogical Society. Retrieved 8 August 2009. ^ "Royal Victorian Order". The Queen's Chapel of the Savoy. Retrieved 20 August 2017. ^ a b Office of the Governor General of Canada (11 September 2012). "Third Biennial Gathering of the Royal Victorian Order Association of Canada". Queen's Printer for Canada. Retrieved 2 December 2014. ^ "Photos & Video: Royal visit to Ottawa". Ottawa Citizen. 12 September 2012. Retrieved 2 December 2014. ^ "No. 55939". The London Gazette. 11 August 2000. p. 8923. ^ "No. 58465". The London Gazette. 28 September 2007. p. 14061. ^ "No. 59001". The London Gazette. 9 March 2009. p. 4181. ^ "No. 59312". The London Gazette. 20 January 2010. p. 831. ^ "No. 59407". The London Gazette. 30 April 2010. p. 7849. ^ "No. 59705". The London Gazette. 21 February 2011. p. 3089. ^ "No. 59724". The London Gazette. 11 March 2011. p. 4555. ^ "No. 59945". The London Gazette. 21 October 2011. p. 20159. ^ "No. 60112". The London Gazette. 10 April 2012. p. 6929. ^ "Court Circular 20 November 2017". The Royal Family. The Royal Household. Retrieved 2 January 2018. ^ "King Harald V of Norway profile". HELLO! Online. 2014. Retrieved 27 October 2014. ^ Harvey, Anthony (9 April 2002). "Queen Mother's State Funeral". Getty Images. Retrieved 27 November 2010. ^ McDonough, Andy (2010). "UK: Queen Elizabeth II Visits Oman Marking the 40th Anniversary". Global Arab Network. Archived from the original on 17 July 2013. Retrieved 27 October 2014. ^ Martínez-Fornés, Almudena (28 April 2011). "La Reina llevará toccado y la Princesa pamela" (in Spanish). abc.es. Retrieved 10 June 2012. ^ Binyon, Michael (2014). "A Distinguished Gentleman". Diplomat Magazine. Retrieved 27 October 2014. Galloway, P.; Stanley, D.; Martin, S. (1996). Royal Service. I. London: Victorian Publishing. ISBN 0-9528527-0-5. Galloway, Peter (2016). The Royal Victorian Order. Spink Books. ISBN 978-1907427763. McCreery, Christopher (2008). On Her Majesty's Service; Royal Honours and Recognition in Canada. Toronto: Dundurn Press. ISBN 978-1-55002-742-6. "Knighthood and Chivalry". Encyclopædia Britannica. 11. London: Cambridge University Press. 1911. Wikimedia Commons has media related to Royal Victorian Order.